Weplay Bean Pods allows children to do multiple activities for fine motor skill development and improving children’s self-care skills. Pods can be used as a tool to hold, scoop up or pick up Beans. Three Beans inside Pods are in different colors, textures and resistances which offer children various sorting, mixing and matching games. Hollow and transparent designs also add vividness to Pods. 1. The size makes children feel like playing a big bean. 2. Children can use the Pods for activities with the Beans. 3. Children can use the Pod(s) as a tool to move beans by one or both hands. 4. Different patterns on the Beans create greater challenges when stacking. 5. Both Pods and Beans have three different colors selected from nature. 6. Hollow design added vividness to the pods. 7. Translucent green Pods bring different visual experiences, allowing for even more color games. 8. Pods can be used for storage when not in use. 1. Picking up, holding or scooping up beans with pods enhances strength and stability of hands. These activities improve children’s self-care skills. 2. Pods can be reassembled with different colors. This activity enhances fine motor skills. 3. Grasping and stacking beans provide different tactile experiences while strengthening fine movements. 4. Children’s color recognition ability can be enhanced through mixing and matching different colors of Beans and Pods. 5. Different colors, sizes and patterns offer children a wide variety of sorting games and activities. Step 1- Randomly choose a card. Step 2- Let children take a look for 10 seconds. 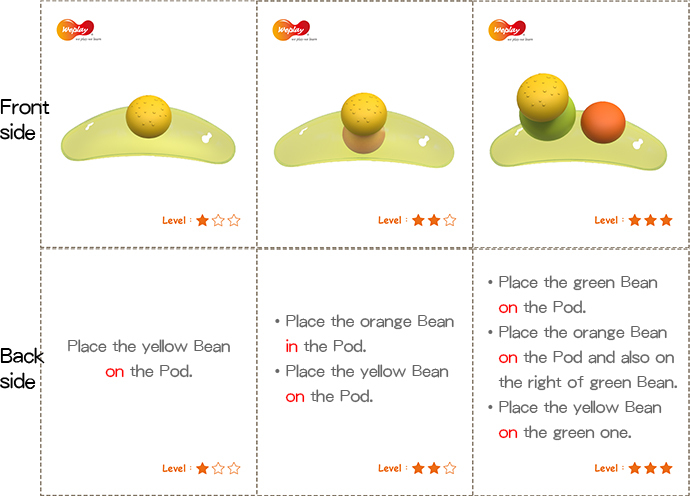 Step 3- Flip the card and ask children to put the Beans and Pods on the right position according to his/her memory. Step 1- Define all the position between the Beans and Pods and use one Pod as the anchor. Step 2- Child A, randomly chooses a card and hands it to Child B without seeing the card. Step 3- Child B reads the card, describing the position of the Beans and Pod. Child A then places the Beans into the right positions as instructed by Child B’s directions.